With Work Manual you can create your own office policies and procedures manual on a fully-editable online system. Additionally, you can use Work Manual to create office policies and procedures manuals as an additional fee-generating service to your clients. Is available online 24/7, from anywhere in the world. Work Manual now comes with templates for Contracts of Employment, Written Employment Particulars and a comprehensive editable Job Description Library as well as optional additional work policies. Work Manual has a full set of office policies and procedures and is a cost-effective way to promote workplace understanding and ensure employees know where they stand. Show clients that you understand their business and create additional fee income for your firm. Work Manual is unlimited – create as many manuals as you want at no extra cost. Use Work Manual’s comprehensive editable library to build employee confidence, eliminate workplace misunderstandings and simplify office procedures. 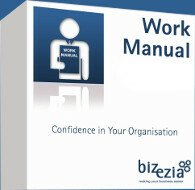 You can access Work Manual using your login at MyBizezia. Your subscription comes with 1-5 logins. You can edit your Work Manual online and, once you have finished, the system will create one PDF which combines all of the sections you’ve edited along with any job description or contracts of employment templates that you’ve added into one document. You will have a comprehensive and fully up-to-date Work Manual that you and your firm can use. You can also use this with your clients, creating an additional income stream. Send your client the finished PDF either directly from Work Manual, via e-mail or by printing out the PDF to send by post. We’re very sure that you’ll find Work Manual is invaluable to you and your organisation. That’s why we have the confidence to guarantee it. We’re so sure you’ll value Work Manual that we’re offering a 30 Day Money-Back Guarantee. If, within 30 days from the start of your subscription, you tell us that Work Manual is not for you, we’ll refund your full subscription with no questions asked. There is no set-up fee for Work Manual, just an easy and affordable monthly or annual payment option with a minimum 12 month subscription. What’s more, it allows unlimited use which means you can produce 1 manual or 1,000,000 and you won’t pay a penny more. There’s also a lifetime subscription – pay a one off fee and pay nothing more – ever to enjoy all updates and changes for no extra cost – forever. For one office with 1-5 user logins, pay just £29 a month or £313 a year. NEW – lifetime subscription for a £1,045 one off fee. The service they provide is faultless. We use the Bizezia products to support our marketing programme, in particular focusing on new start up businesses. The service they provide is faultless, the online portal integrates with our own website and adds credibility to our existing marketing materials. I would be happy to recommend them.